This article presents how works the GECO air application, from its installation to its daily use. It also explains the scientific approach used to estimate pollutants and answers the questions that the most skeptical might ask. The app is available on the application stores for free, for iOS and Android. You can discover and test the application as a “demo” user but if you want to take advantage of all the features of the application,you can create your own account at any time. Although free, GECO air is the result of extensive research work. The algorithms used are a direct application of IFPEN’s expertise in the field of engine, transport and software development. They have been the subject of a patent and several scientific publications..
… to collect my personal data ? This application is not intended to collect personal data for commercial purposes. The only stored data are pollutant emission signals on your trips. These data are anonymized, stored and used by IFPEN researchers to improve road infrastructure and regulations in terms of impact on air quality. The user is asked to fill in his registration plate when the account is created. From this license plate it is possible to automatically retrieve all the technical specifications of the vehicle using a database provided by Argus to IFPEN . These specifications (fuel, year, cubic capacity, type of post-treatment, etc.) are used to parameterize the mathematical models which will allow to estimate the polluting emissions. What precautions are taken for me? Why is the license plate number necessary? Vehicle emission levels are highly dependent on the vehicle’s specific characteristics. Our physical models take these data into account. However, it is not feasible to ask the user who in the vast majority of cases does not know this information or does not take the time to provide it. Thanks to a partnership with Argus, we are able to know all these parameters only from the license plate. Thus, the user just has to enter his licence plate number so that all our physical models are parameterized automatically. In addition to these technical data, no other information, and in particular the registration number, is stored. However, if the user does not wish to enter his registration number, he can select a standard vehicle from a pre-entered vehicle list. At the moment, only french users can benefit from this automatic tool but we are currently dealing with new database providers from other countries to propose this feature to more people. In order to measure your footprint, GECO air automatically detects your daily movements. The heart of the Geco Air application is the analysis of your car trips, in order to give you the means to improve your driving. However, even with the best possible driving, the use of a car is not always the best choice of mobility type (eg. for short route or heavily traffic jammed …). Therefore, we wanted to detect a greater number mobility types, in order to put into perspective the concrete emission levels linked to the displacements according to the choice of mobility type. Thus, beyond detecting and alerting the user on bad practices, GECO air makes it possible to measure the gain brought by mobility habits changes. Our goal was to compute a daily “timeline” of the user in the most automatic way possible. Thus the user concentrates on the information that is returned to him and does not lose time manually to inform his movements. Thus, our algorithms alone detect the beginning and the end of each path, and record the data necessary for the estimation of the pollutants. They also detect the mobility type: walking, running, cycling, bus, car, train … We are actively working to improve this recognition. However, the current maturity of the technologies does not make it possible to reliably differentiate a journey by car from a trip by bus or train. The user can always manually modify the mobility type associated with each of his movements in order to correct his timeline. These types of movement are thus not detected on smartphones which lacks theses sensors and APIs, in particular the iPad and tablets. Special precautions have been taken to make this feature consume as little battery as possible. The detection is based on the cellular antennas and the GPS of the phone. The use of the latter which is very energy-intensive, is not systematic. The potential start of a new path is firstly detected by the change of cellular antenna. The GPS is then activated from time to time to check whether the measured speed is typical of a car trip. If that condition is completed, then the GPS remains active during the movement to record the speed and the slope every second, which is the data essential to the estimation of the pollutants emitted. During the day, the GPS is only used as part of my car journeys, reducing the use of the battery. 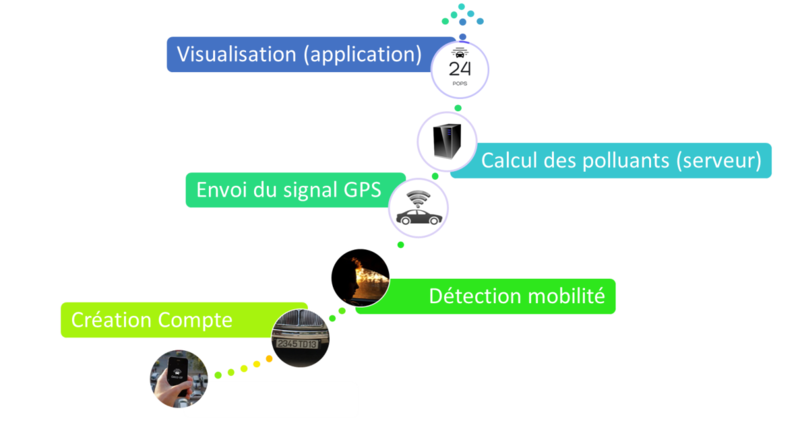 Send GPS signal : At each end of trip, the recorded data necessary for the estimation of pollutants are sent to our servers. If the smartphone does not have cell data at this time, the route is stored locally and reissued later. For a car trip,these data are the instantaneous speed and slope (at 1Hz), the GSP coordinates and the characteristics of the vehicle used. All the data and calculations are on the server, allowing to reduce the memory load of the application on the phone. This ensures the same computing performance regardless of the smartphone model. The collection of these data has a great scientific value: it allows to carry out on the scale of a territory studies on the real use of the vehicles and its impact on the pollutants. This point will be explained in detail later. All precautions are taken regarding the anonymity and security of the data stored on our servers. Data exchanges are optimized to reduce data consumption. For example, for a typical application (two journeys per day, regular use of the application) data consumption does not exceed 5 MB per month. The vehicle speed and altitude signals recorded by the GPS are sent at the end of the journey on the IFPEN servers. From these signals, the engine speed and torque are calculated using mathematical models taking into account the specificities of the vehicle (mass, type of gearbox). Using the engine speed and torque, the internal variables of the engine are calculated, such as fuel flow and exhaust temperature. These quantities are essential in order to estimate the polluting emissions. The algorithms for calculating the pollutant estimates developed by the IFPEN researchers were patented by the INPI. The mechanisms of formation of pollutants are highly dependent on the engine technologies used. The specificities of each vehicle (fuel type, injection system, type of aspiration, level of hybridization) are taken into account when choosing the mathematical equations that will be used to model the formation of pollutants. Once the formulation of the model is chosen, it is calibrated to the specifications of the vehicle (cylinder capacity, number of valve, power, torque, …). The models obtained are therefore much more accurate than average values of consumption or polluting emissions. Consequently, the consumption and emissions estimated by GECO air can be very different from those obtained during a normalized cycle. They correspond to the values observed in actual use. NOx emissions from diesel engines are one of the main pollutants responsible for the recent peaks in pollution. Their modeling in GECO air is based on an estimate of the rate of burned gases enclosed in the cylinder. Indeed, diesel engines use exhaust gas recirculation (EGR) in order to reduce their NOx emissions. However, this recirculation of the burnt gases is not at the same level over the entire driving field: if it can reach 30% of the mass of air admitted by the engine at low loaded operating points (low torque) Is often completely deactivated when we ask the engine a little more. As a result, depending on the driving style the emissions will vary significantly. The EGR setpoint mapping is a result of the calibration choices of engineers performing engine tuning. Consequently, GECO Air does not know the exact mapping of each vehicle but recalculates it, taking into account the calibration methods and the specificities of each vehicle, including: year, standard, mass, Route, scores on the approval cycle, the type of post-processing. The most recent diesel vehicles are equipped with NOx after-treatment of the SCR or NOx trap type. These systems, located inside the exhaust line, carry out chemical reactions in order to reduce exhaust emissions. However, these post-treatment systems have very variable efficiencies depending on the use. Indeed during a cold start, these systems need an activation delay. On the other hand, they do not have the same performances over the entire motor field. These systems are therefore modeled in GECO air, which makes it possible to capture the impact of the use on NOx exhaust emissions. The emissions of carbon monoxide from a petrol engine are closely linked to the richness of the engine. When the combustion is carried out under stoichiometric conditions (at wealth 1), the emissions are contained, and generally proportional to the fuel consumption. When the combustion is carried out in a rich mixture (richness greater than 1), the CO emissions increase strongly. The richness is thus the parameter of order 1 on the formation at the source of the carbon monoxide. The carbon monoxide formed by the combustion is then treated by the oxidation catalysts fitted to the vast majority of gasoline vehicles (compulsory since 1993). This depollution system has an excellent efficiency, as long as it works with a richness 1 and is active, that is to say at a sufficient temperature. The two situations that will generate emissions of carbon monoxide in the atmosphere in significant quantities are start-up (and the first kilometers, which is why short trips must be avoided) and the operations in rich combustion. In order to capture these phenomena, our models reproduce the rise in temperature of the aftertreatment system in order to determine its increase in efficiency over time as a function of the temperature and the exhaust flow rate. They also reconstruct a richness of operation of the engine at every moment, taking into account the general rules of calibration of an engine. The enrichment of the combustion on the gasoline engines occurs at high load, that is to say generally around Of 75% of the maximum power, with a thermomechanical protection function of the motor. It is therefore clear that the level of CO emissions will be closely linked to the driving style: if the driver has a foot that is light enough to never exceed this threshold, his CO emissions will be very reduced. Only one model deported on each user as our allows to take into account this sensitivity. The FARis equal to 1 in the petrol engine (except at high load when it increases linearly with the load) and varies between two values for the diesel engine. The EGR fraction (exhaust gas ratio) is known for each point on the engine board (determined as justified in the NOx section). These assumptions are combined in the iterative algorithm presented on the above graph and applied for each point of the engine field to determine the mean effective pumping pressure (PMEP), to deduce the mean gross effective pressure fuel. This iterative process, which is mainly aimed at calculating fuel consumption, also allows mapping of air mass flow, exhaust temperatures and the different pressures and temperatures in the air loop, Then necessary for the estimation of pollutants (training and post-treatment). The equations used to determine fuel consumption, total intake mass flow and pressure and temperature conditions in the air path are detailed in an SAE publication  for EGR-free engines. These equations have been adapted to EGR engines to improve the estimation of the exhaust mass flow rate given to the emission model. G. Alix, J. Dabadie and G. Font, “An ICE Map Generation Tool Applied to the Evaluation of the Impact of Downsizing on Hybrid Vehicle Consumption,,” SAE Technical Paper, vol. 10.4271, no. 2015-24-2385, 2015. The fuel consumption maps generated with this model showed good agreement with the measurement, as shown in the figure below, which shows an example of fuel consumption mapping generated for a turbo gasoline engine, Estimation in relation to the measurements. Historically, the most popular gasoline engines used an indirect injection system, ensuring good mixing of air and fuel, which allows for very low particulate emissions. However, the recent emergence of direct injection engines leads to very high particle levels comparable to those of diesel engines. This is a critical point because most gasoline engines are not equipped with a particle filter. The particle formation mechanisms of petrol engines are very different from those of diesel engines and the use of a specific mathematical model has been needed to estimate Particulate Number (PN). The fuel consumption of a vehicle is directly proportional to its carbon dioxide emissions. For a petrol vehicle, a consumption of one liter per hundred kilometers is equivalent to CO2 emissions of 23g / km. For a diesel vehicle, because of a different composition of diesel, 1L / 100km is equivalent to 26g / km of CO2. As a result, fuel consumption is taken into account in GECO air, even if it does not appear directly in the application. How does GECO air take into account gear ratio engaged? The gear ratio is calculated as a function of speed and acceleration. Goal: A UNIQUE indicator: the Mobility Score. No need to be an expert: I follow the advices to maximize my mobility score. GECO air estimates pollutants related to each of my trips. This includes in particular nitrogen oxides (NOx), nitrogen monoxide (CO), fine particulate matter (PM), unburnt hydrocarbons (HC) for which specific models are in place. Other unregulated pollutants (SO2, NMVOC) are also taken into account, although no specific models have yet been established due to lack of data. A standard level of emissions is taken into account according to the state of the art (emission factor COPERT). CO2, although not a polluting gas per se, but a greenhouse gas, is also estimated. However, it is impossible to communicate independently on each of these pollutants in a consumer smartphone application. First of all, these magnitudes remain very unknown to the general public. Secondly, changes in the different pollutants are sometimes antagonistic: a driving style can minimize NOx emissions to the detriment of particles or vice versa. It would then be impossible to provide coherent advice to the user by seeking to independently reduce each pollutant. It would also be very difficult for him to follow his progress. For these reasons, all the pollutants have been aggregated into a single indicator: the mobility score. This unit is homogeneous to grams of pollutants per kilometer. The calculation formula is independent of the type of vehicle, and therefore particularly the type of fuel. It therefore allows an objective comparison of the emission levels of each vehicle. Pollutant emissions are linked to three factors: my vehicle, my journey and my driving style. GECO Air decomposes the impact of these three factors. The part of the journey: even if my driving is ideal, certain types of path generate more pollutants: for example, a short journey or a heavily bottled route. The part of my conduct is the part which I could have avoided by adopting simple reflexes. Advice is given me to reduce this share. How is the part of my driving style calculated? To evaluate the driving style’s effectiveness, the emissions obtained on a course are compared with those generated on the same course with a reference driving style: limited acceleration, maximum speed on a restricted motorway, good anticipation and maintenance of speed. On each route, the driving style tab of the application shows the share of emissions that could have been directly avoided by adopting this style of driving, and gives advice on how to do this. My driving score (between 0 and 4) is directly related to this share of emissions that could have been avoided: I have doubled my emissions because of my driving style, it is a zero; I issued less than 10% in addition to the target, it’s a 4! No advice in real time, keep focus on the road!